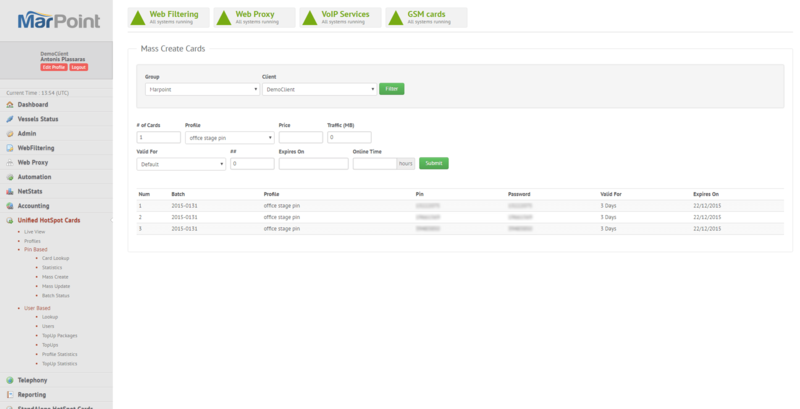 The Marpoint Unified Management Platform provides the option to create Crew internet hotspot cards, allowing the office to share the FBB or VSAT monthly data package allowance of each vessel with the crew members. By sharing a percentage of the cost with the crew, the office saves on satellite monthly costs while the crew gets internet access at very low rates. Crew Internet on VSAT allows for bigger Internet packages and lower cost per MB for seafarers (VSAT packages usually include unlimited data packages). Crew Internet on Fleet Broaband “FBB” – the bigger the FBB package, the lower the cost per MB. When combining office and crew internet on the same package, you get lower monthly cost for both office/business and crew. 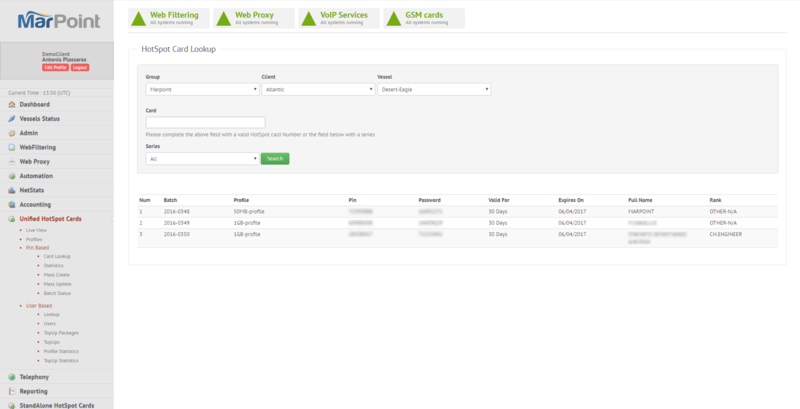 Marpoint Crew internet offers almost complete customization as part of the Crew “Internet Café”. Ship Managers and owners can customize the crew internet by PIN-based or User-based crew accounts. Upload crew data by excel, csv. etc. Data Profiles combine features from both PIN-based and user Internet cards; for more information and clarifications of Marpoint Crew Internet cards please contact us for a tailored-made solution. 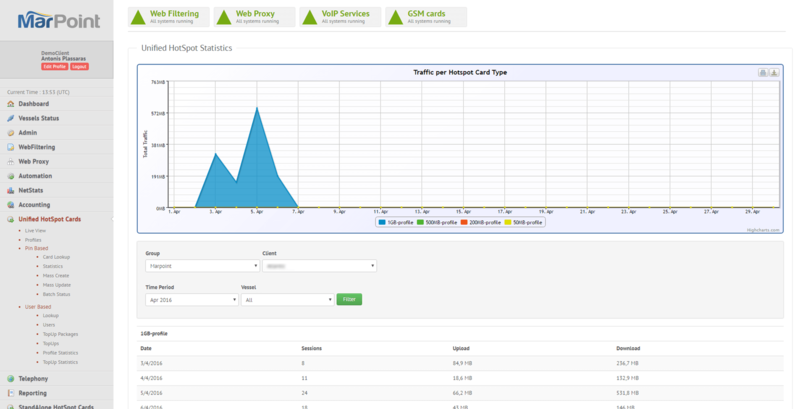 With the Live View option, you can choose a client and display to your screen all the hotspot cards that are active, as well as the card ID, start time, device IP, online duration, traffic sent (upload) and traffic received (download) . The image below shows an example view for a specific client. 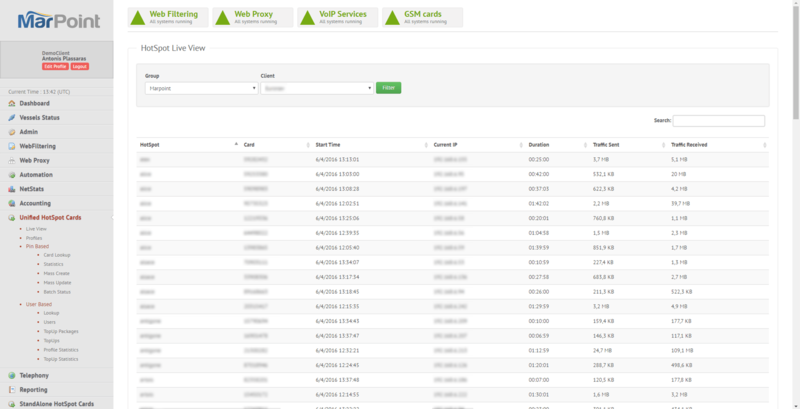 With the Card Lookup option you could see the network usage and remaining bandwidth or time of a certain hotspot card. When you click the Card Lookup option the following window appears. 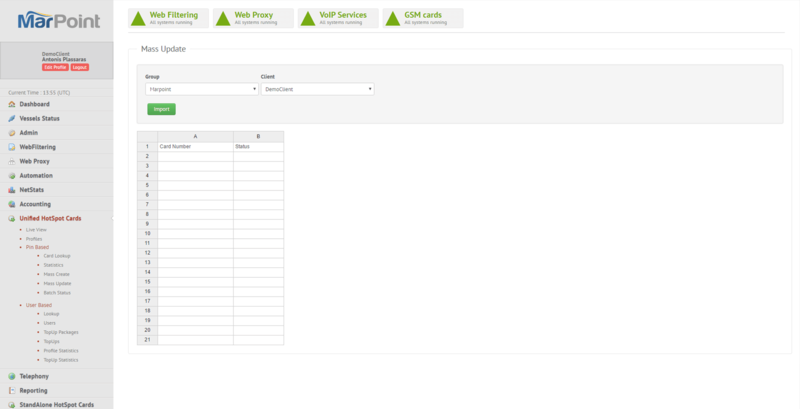 With the statistics submenu you are able to see statistics per client, office, building, etc. of the client, used for any given period of time (i.e. month, day, week). When you click the Statistics option the following window appears. 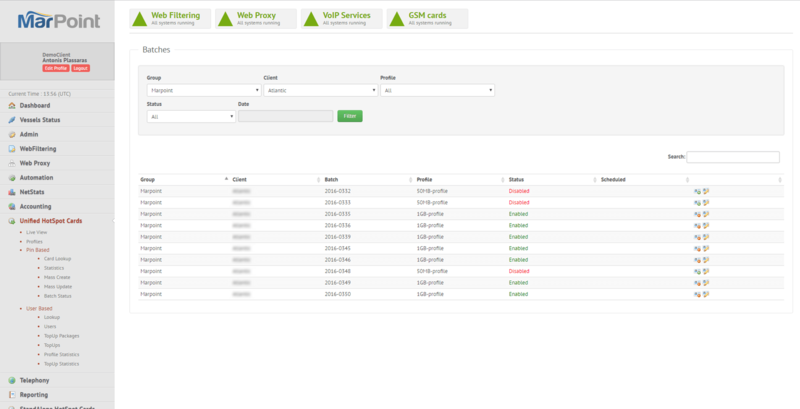 With the Mass Create option the Client can issue a batch of hotspot cards for its vessels. Choose Number of cards, profile, price, traffic (MB), Valid for (hours, days, months) and click submit. If you want to disable or enable a batch of cards, enter client’s name, the password (Google Authenticator) and click import. Type 0 in order to disable or 1 in order to enable a card. When you click the batch status option the following window appears. The Batch Status option allows you to enable/disable or schedule when you want to send a specific batch of hotspot cards to a vessel.